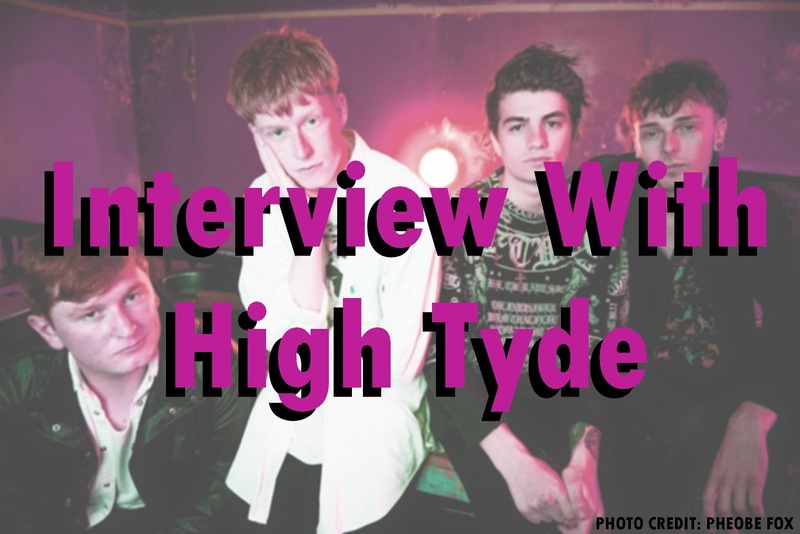 On Saturday 5th November, I headed down to one of Leicester's most popular music venues, The Cookie, to interview and watch High Tyde play.They were fantastic! 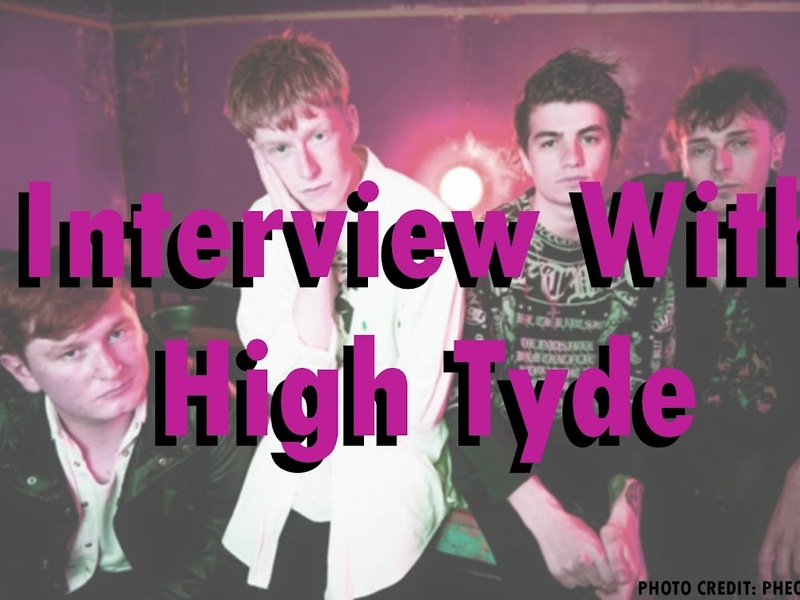 High Tyde is made up of four members, the front man being Cody (vocals and bass), Connor (guitar), Spencer (guitar) and Louis (drums) - they are constantly being played on BBC Radio 1, so if you haven't heard of them, then where have you been? I had the chance to interview Connor and Cody before they got on stage and they are great lads! I met Spencer and Louis later on, they were fab as well! I had a quick chat with them and thought that I might do something nice for you all again. There is a GIVEAWAY! I am giving away a large signed High Tyde tour poster for free, the only condition is that it is UK RESIDENTS ONLY. All you have to do is FOLLOW ME on Twitter and RT this tweet to enter. I will be choosing a winner very soon, the final day to enter will be announced on Twitter nearer the time. So I know the name High Tyde originated from a Noel Gallagher song, did you have any other names before that that you considered? Cody: We were called Tides for like two weeks. Cody: Yeah a day and then we typed it on Facebook and found out that there were like a hundred other bands called Tides! We had to change it pretty ASAP. I guess it better to change it two weeks in than two years in! Were there any other names? Connor: No that was it. You have recently brought out a new EP ‘Real’ which is fantastic, how long did it take you to write? Cody: All our Ep’s are written in the same time, two or three weeks because when you are writing songs one after the other you get the same kind of vibe. They all sort of fit together which is good when you are making an EP. So probably about a month maybe. Connor: Yeah, the older one was on a piece of paper. Cody: Well that was kind of a jam that we elaborated on, so yeah around a month. Which one of you writes the songs? Cody: We all jam in a room and whatever comes up. Are there ever any arguments as to which ones you choose? Cody: No, there is never any arguments we all decide together, we usually write just three or four songs which go together. Cody: Oh yeah, it will change like the last week or so. Connor: Or a day before it gets uploaded! Cody: Yeah we are perfectionists! Do you record at a friend’s studio? Cody: Yeah we have recorded at the same place since we were fifteen years old! Did you all go to school together? Cody: No, we all went to separate schools. We just met down the skate park through music and stuff. Connor: Yeah we all used to skate. Cody: You used to BMX didn’t you? Connor: Yeah that’s how we all used to know each other, we were just talking about this an hour ago when we were having dinner, and our tour manager asked is how we all knew each other. The designs for the covers of the EP’s are really awesome, who designs them? Cody: Spencer designs them, he’s kind of fallen into it. We all just dabble in different areas. I do the tour diaries and stuff. Spencer does all the artwork. 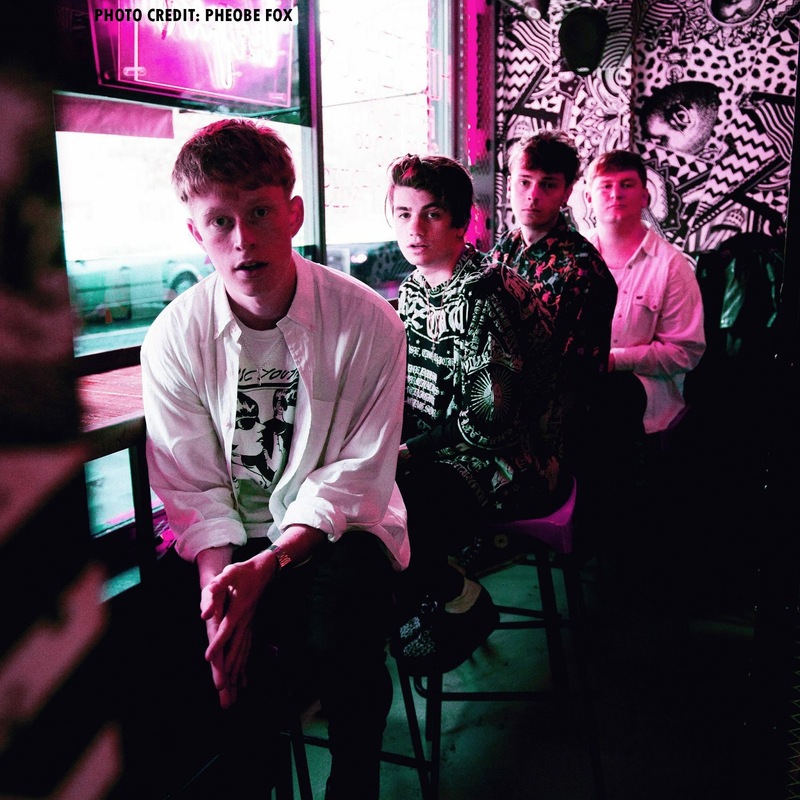 Connor: We are quite DIY, everyone has their own little role and get on with it. Cody: It’s all created by us! Did you all study music at school? Were you all in bands, did you do battle of the bands and things like that? Cody: Yeah we did all that. I think every band has some sort of metal band influence at that age! So can we expect an album anytime soon? Connor: Of course there will be one, don’t know when. Cody: You know when there is a band there is always going to be an album at some point. Cody: Yeah next year! We haven’t finalised anything yet. Connor: We have only just released this EP so we are planning stuff. Cody: Yeah we are always planning ahead but there will definitely be an album at some point. Your video for Karibu was filmed around Brighton was that fun? Cody: Yes and Worthing actually which is where we are actually from but no one knows that place so we say Brighton! Do you all live in Worthing? Connor: No we all live around twenty minutes up and down the coast. Cody: Yeah that was so much fun. Connor: It was so long ago. Cody: We got the lyrics on cards and just handed them to random people. Connor: Every time I watch that video I think ‘this is great’, there was no budget for it, it was just, one of our mates and a camera! Connor: There was one guy who was like, all right I will do it but hurry up! That’s the older guy sitting outside a record shop in the chair with the fag in his mouth. He was like I really don’t want to do this! Cody: It’s been amazing, our favourite show was obviously London, it was a big one for us to date. Brighton and London were the only two shows that were really, really big ones for us with about six to seven hundred. The rest have been about two hundred and fifty caps. They have just been mad. Cody: Girls are starting to crowd surf and stuff now, there’s mosh pits breaking out every second. I have managed to jump out in the crowd every night. I usually do it about three songs in to get the crowd pumping. I used to drop down quite a lot but this is the first tour I have been caught every single night! Connor: What I like about this tour is we have had quite a diverse age. There’s been a lot of young people doing their first crowd surf ever. When they go mental it makes you want to go mental. Cody: Exactly it makes the show go better. Is there anything about another band member that annoys you? Cody: Louis’ addictions to things, he will be addicted to Terry’s chocolate orange one day, now he is addicted to burritos! It’s ridiculous! Oh and Peach Tea, because it takes up the whole of the van. It’s not any more but it was a problem! Connor: Better to be addicted to that that beer I guess. So I have seen on Twitter that Spencer has a mixed variety in taste of films, what are your favourite films? Connor: One of my favourite films is Pulp Fiction. Cody: I really like Shaun of the Dead. Do you like Zombie films? Cody: Yeah I am really into The Walking Dead at the moment. That’s an amazing series Have you seen series seven? Yes when Glen dies? Ah have I just spoilt it for you? Cody: No, but imagine if you had! Cody: So many people were finding out! Connor: Me and Spencer have been hooked on ‘The Orange is the New Black’ at the moment. We are so addicted to it, we have been watching it in the Travelodge! If you were given £50,000 what would you splash the cash on? Cody: High Tyde! Oh and a massive Amp! We put all of our money into this band to make it cooler. We all have part time jobs. Cody: Me and Connor work in the hospital. Louis woks at Ask, the Italian. He’s a waiter. He loves the food chains. It’s got to be done to fund the band. This is your last show on your tour are you going to go out and celebrate later? Cody: We went out last night, we have all been really ill on this tour for the past week. We have taken it easy on the alcohol for the past three or four days so we could go out last night. It was a big one wasn’t it? Cody: We have got to drive back tonight so! Connor: We have done a lot of celebrating on this tour. Cody: Back to working hard again. More planning and writing more songs. Are you going to another tour next year? Cody: Definitely, we want to do a lot more show next year. Are there lots of places to gig in Leicester? Cody: Oh my God! The Soundhouse, we played there when we were about fifteen years old! It was to about one kid! We had nowhere to stay, this random girl hooked us up with a Uni flat it was mental. Connor: We went to a party at DeMonfort Uni! Have you got a final message for your fans? Cody: Watch this space, more music to come soon! More shows and bigger mosh pits! Connor: And the Real EP is out now! Cody: So go and buy it because it’s the best of our work so far! Don't forget to enter the giveaway and follow the band on Twitter (@wearehightyde)!